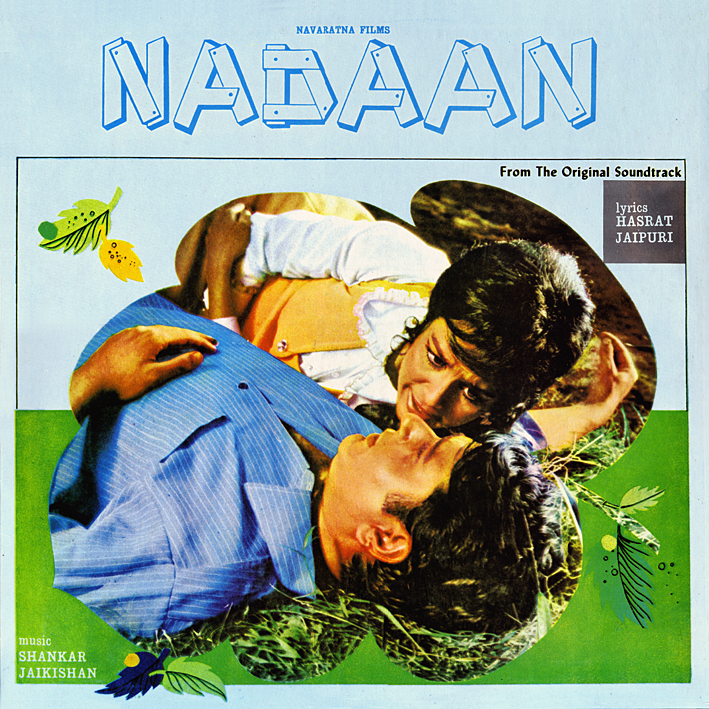 My copy of 'Nadaan' [review] is a Dutch reissue of unknown date and possibly dubious legality. But then I only paid $10 for it, considerably less than the 3-digit sums collectors have been known to fork out for Indian originals. Is it that good then? Well, one song is. 'Naach Ae Dil' is Shankar Jaikishan doing big band rock 'n' roll dance as only Shankar Jaikishan could. Surf rock guitar riffs, train siren horns, high-octane drumming... think 'Jan Pahechan Ho' and 'Kiss Kiss' and you'll get the idea. OK, it doesn't have Rafi on vocals, but we get a fired up Asha instead (plus Helen) so who's complaining? There's a lot of percussive action on the rest of the album as well, albeit of a more traditional nature. I'm quite fond of 'Bol Nadaan Dil' and 'Jeevan Bhar', and 'Ae Baadal Jhoom Ke Chal' has a drum pattern that curiously brings the samba-reggae style of Brazilian Olodum to mind; surely a coincidental resemblance. Good stuff all of them, but inevitably it's the awesome dance number I keep returning to. Great Share PC, though Shankar Jaikishan were at their twilight years when this album was released but it consisting few good songs, all were sung by Mukesh & Asha, Lata Mangeshkar had a spat with the duo and she had stopped singing for them & it was the one of the reasons that the great musicians lost their Number one spot to Laxmikant Pyarelal. Not sure what or when their last great score was – it's probably debatable – but yeah the early 70s were indeed the end of their era. I wasn't aware of the Lata spat. Oddly enough, all the Shankar Jaikishan LPs still on my want list seem to be from this period. thanks pc for this share.